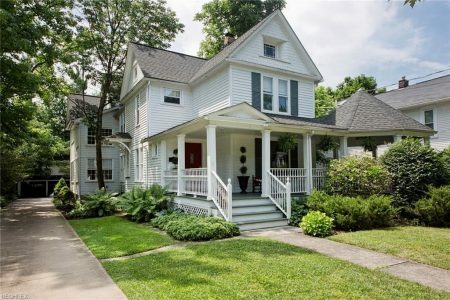 Spectacular updated Victorian century home located in the heart of Chagrin Falls Village! With its incredible wrap around front porch, this house is perfect for the social gatherings and the most amazing experience of the small town lifestyle! Stunning chef’s kitchen featuring high-end cabinetry, granite and onyx counters, herringbone tile and stone backsplash and top of the line appliances! The open floor plan from the kitchen to the large great room is impressive both in the ample lighting from multiple windows and French doors to the easy open living space, including a wood burning fireplace and window seats. A lovely living room and rich office area greet you as you enter the foyer. Very very special bedroom with full bath accommodations is waiting for your guests on the first floor. The second-floor master suite is exquisite in both its size, walk-in closet and large bath featuring dual sinks and soaking tub. This is one of the few homes in the village that features 5 bedrooms if needed, finished lower level that can serve as a media or additional family room along with a second-floor laundry. Breathtaking architectural details throughout, including wrought iron staircase, high ceilings, rich woodwork from the crown moldings to the hardwood floors on both levels and much more! Call for an appointment today!